Award-winning musical Come From Away arrives in the West End following critical acclaim on Broadway. Playing at London’s Phoenix Theatre, Come From Away is the moving musical that brings to life the true stories of the 7,000 stranded passengers and the small town in Newfoundland that brought them in. With tensions running high, uneasiness transforms into music that soars through the night, and life-long friendships are created. With musical numbers including “Welcome to the Rock”, “Me and the Sky” and “Something’s Missing”, this Drama Desk Award-winning production is created by Irene Sankoff and David Hein, and is directed by Tony Award-winner Christopher Ashley. A thrilling, emotive and uplifting new musical, Come From Away runs at the Phoenix Theatre. A wonderful show with a terrific cast which certainly deserves more than five stars...Laughter tears and a reminder of a time we should never forget. There should be more than a 5 star rating for this. It was fantastic. The audience roared its approval. I had been looking forward to it but it was loads and loads better than I had imagined. I LOVED IT. Hope to visit again before it closes. Three cheers to all involved including the real people to whom this all happened. As one of the come from aways, from flight CO29, staying in Gambo with the fantastic Pritchett family, I was a little apprehensive that this could easily go awry. But it absolutely caught the complex atmosphere, and was utterly right on every front - writing, music, staging, acting. It may just persuade me to dig out my last little miniature of Screech and kiss a cod. Or see it again. And dig out the Screech. Absolutely amazing! We laughed, we cried, we danced, we loved it! Genuinely one of the best shows I have ever seen. The cast is amazing; I felt as though I was leaving friends when the show finished. The band was fantastic, as well. I am already hoping to see the show again! One of the best pieces of theatre I have ever seen. I have been obsessed with the soundtrack from the first time I heard it, and this cast did not disappoint! It truly is an ensemble cast, and every single cast member is absolutely brilliant. The staging is simple but incredibly powerful and the message of the show is so moving. I will most certainly be coming again as soon as I can! Absolutely brilliant, one of the very best theatrical experiences ever. Saw this Sat Feb 9 th matinee. At the end the whole audience rose as one to give a well deserved standing ovation. An outstanding cast of 12 playing a variety of characters in a simple setting was brilliantly executed with wonderful choreography. Heartwarming with humorous touches - just go, must be seen. I was completely drawn in to the story, loved it, loved it loved it. Plus the accompanying band and music were also outstanding. A truly beautiful and moving piece of theatre. Five stars doesn't do this heart-warming story justice. 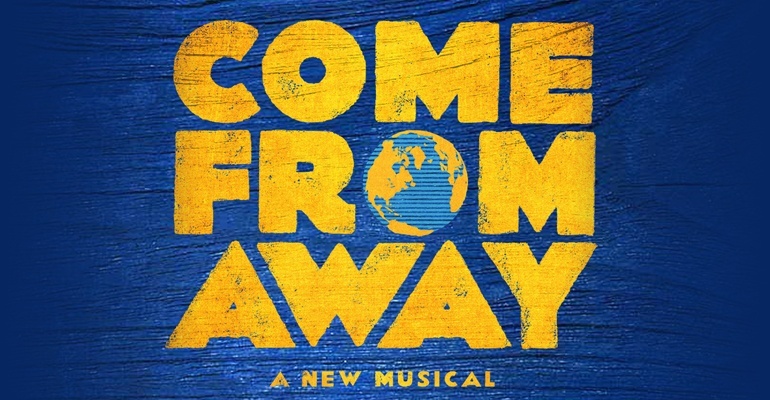 I am a 'Come From Away'. Canadian born but I joined the British Air Force and I was posted to Gander, Newfoundland from May 99-Dec 01 and I worked at the airport. My 'Screeching-In' certificate is signed by 2 of the characters in the musical (Claude Elliot and Derm Flynn). I loved the show and I can say the warmth and generosity portrayed is typical of Newfoundlanders and my 2.5 years living in their community will never leave me. They are a wonderful community. The musical portrays people at their best which is sometimes only visible in the worst of scenarios. Kicking tunes too!! !